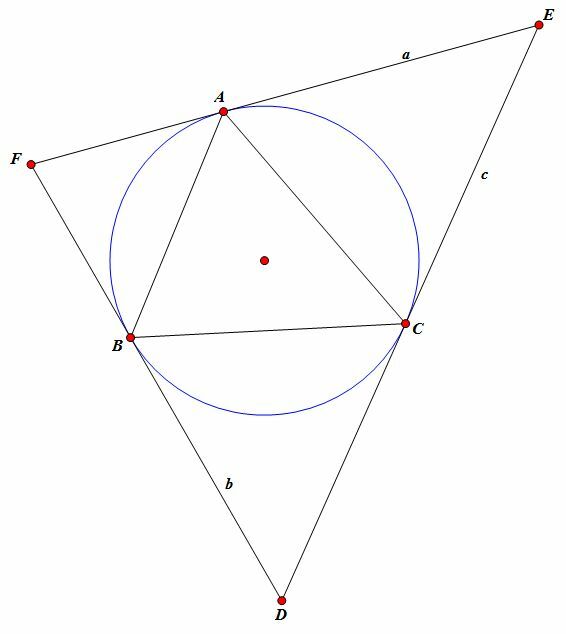 What is the name of this (circumscribed) triangle? PS: the construction below is a construction in euclidean geometry (the Beltrami Klein model is a euclidean (nonconformal) representation of the complete hyperbolic plane), and in the Beltrami Klein model the triangle $\triangle ABC$ is an ideal triangle. At the point $A$ draw the line $a$ tangent to the circumscribed circle. At the point $B$ draw the line $b$ tangent to the circumscribed circle. At the point $C$ draw the line $c$ tangent to the circumscribed circle. Most times the lines $a,b$ and $c$ will pairwise intersect. Point $D$ is the point where $b$ and $c$ intersect. Point $E$ is the point where $a$ and $c$ intersect. Point $F$ is the point where $a$ and $b$ intersect. What is triangle $\triangle ABC $ called in relation to triangle $\triangle DEF$? Or what is triangle $\triangle DEF $ called in relation to triangle $\triangle ABC$? What is triangle $\triangle ABC$ called in relation to triangle $\triangle DEF$? According to Wikipedia, the inner triangle is called the Gergonne triangle, contact triangle or intouch triangle of the outer. What is triangle $\triangle DEF$ called in relation to triangle $\triangle ABC$? I don't know an answer to this yet, but searching the web with the three names given above might turn up some established name for the converse as well. Not the answer you're looking for? Browse other questions tagged geometry terminology triangles hyperbolic-geometry or ask your own question. Is it possible to reconstruct a triangle from the midpoints of its sides? Is this question wrong? How can a circle be named ABC; it should be the triangle ABC, right? 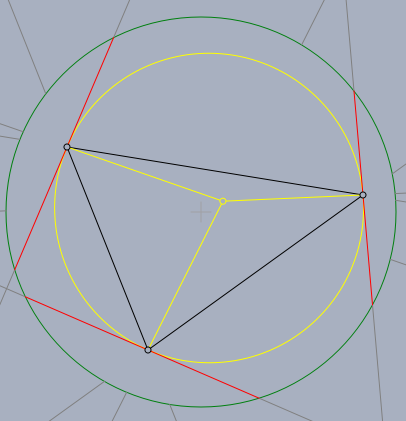 How does a polar triangle characterize/ define a hyperbolic ellipse?